Special events throughout the week – anyone for Table Tennis Tuesday? Where else can you find New Orleans shrimp in Piccadilly? Please contact Bubba Gump Shrimp directly at [email protected] to redeem this offer using your iVenture Card. We recommend reserving a table to avoid disappointment. A menu to choose from will be provided with all extras being settled directly with the operator. All menus are subject to change. No drink included. ‘Life is like a box of chocolates.’ Remember Tom Hanks delivering that line in the famous movie named after his character, Forrest Gump? Well, the Bubba Gump Shrimp Co. lives up to that promise when it comes to their diverse menu. The franchise is already successful in the US, and has now opened its first UK branch in London, right in the heart of Piccadilly. The Set Lunch menu features a variety of delicious options, of course including the famous shrimp, which can be served in up to 20 different ways. These seafood ‘hush pups’ aren’t something you’ll find on the menus of most other restaurants in this area. The franchise slogan might be ‘it’s all about the shrimp’, but there’s a lot more than that on offer at the Bubba Grump Shrimp Co. The chain’s eclectic options include a huge range of choice from American style hamburgers, grilled fish, and a mind-boggling array of salad options, such as pear and berry. Staff here give customer service the American treatment too, delivering Forrest Gump trivia to your table along with your order. Prepare to be treated like a VIP. Want to buy the t-shirt? Visit the gift shop for a wide range of Forrest Gump merchandise. 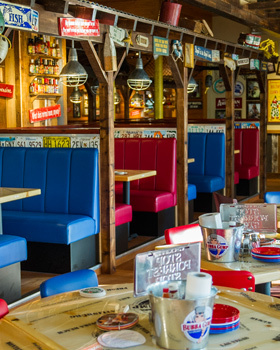 You can even purchase from a Bubba Gump’s range of hot sauces. To get there, simply take the tube to Piccadilly Circus on the Piccadilly or Bakerloo Line. The restaurant is easily found on Coventry Street.